The Jauncey pen is taken up posthumously this time by Professor H. Wade Hibbard of the Department of Mechanical Engineering, University of Missouri. He wrote the following indignant letter on 21 December 1917. The letter is genuine. It has been transcribed for easier reading from the original (see below) found in a Bureau of Investigation file accessible on a military records site (now behind a pay wall). The Bureau was the predecessor of the Federal Bureau of Investigation (FBI). 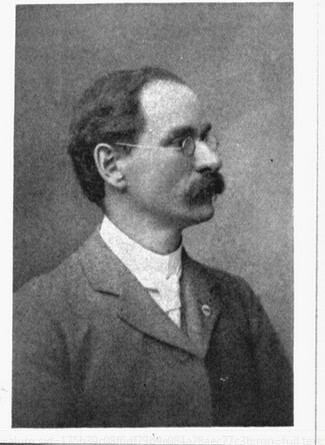 Background is contained in the Australian Dictionary of Biography entry on GEM (Eric) Jauncey, which notes that Jauncey ‘attempted to return to Australia in 1917 but was refused a passport because of pacifist comments he had made in private letters, which were intercepted by censors’. The Hibbard letter gives an idea of the intensity of pro-war or patriotic feeling in the United States, which was replicated among many Australians. 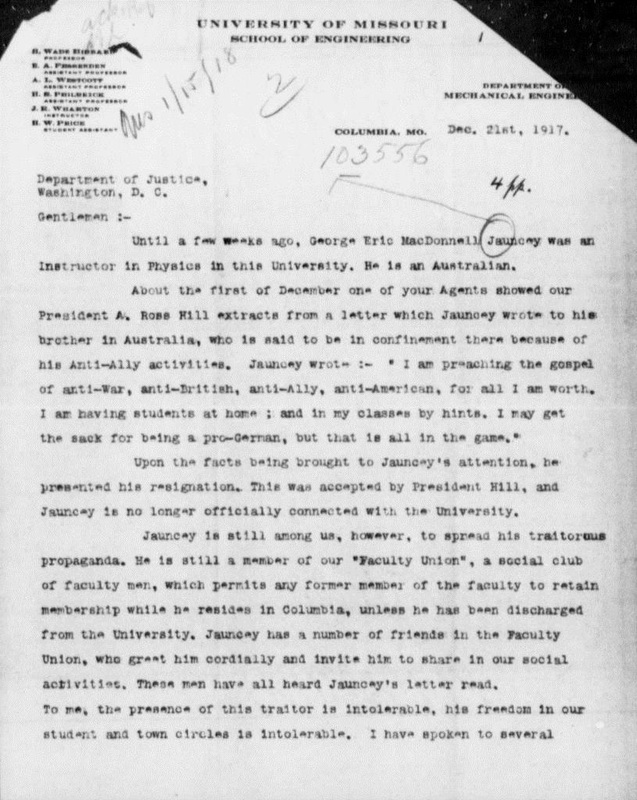 Jauncey lost his university position in Missouri essentially because of co-operation between the Australian (Hughes) Government of the day and US authorities. One can speculate that Eric’s experience may have helped influence the views of his much younger brother, Leslie, the author of The Story of Conscription in Australia (1935), which presented the Hughes Government’s attempts to bring in conscription in a quite unfavourable light. Leslie joined his brother in the US in 1920 while Eric Jauncey was still attempting to obtain passports for his family’s return to Australia. More detailed background to the letter is contained in our biographical data on Eric Jauncey. Research by volunteer researcher, Steve Flora. Honest History presents this material on Eric Jauncey as part of our commitment to original historical research (whenever we can manage it, given the other exigencies of producing this website). Columbia, Mo. Dec. 21st, 1917. Until a few weeks ago, George Eric MacDonnell Jauncey was an Instructor in Physics in this University. He is an Australian. Upon the facts being brought to Jauncey’s attention, he presented his resignation. This was accepted by President Hill, and Jauncey is no longer officially connected with the University. It is stated that neighbors heard Jauncey tell his wife not to sign the food-conservation pledge. The wife of Prof. E. J. Durand states that Mrs. Jauncey talked with her in rabidly anti-American fashion. Jauncey states that he is an International Socialist. The students’ Socialist Club holds regular meetings. C. A. Ellwood, Professor of Sociology and intensely patriotic, gave an address to the Socialist Club upon the Russian Bolsheviki, denouncing them. Jauncey was present and immediately addressed the Club, upholding the Bolsheviki in all they had done. This morning I picked up on the magazine table at the Faculty Union the three enclosed copies of The People’s Press, which I have blue pencilled. They were not there yesterday. I do not know whether Jauncey placed them there. On April 28, 1917, (I think I have the date correct) Jauncey asked for a passport to return to Australia. It’s refusal was due to the Australian Government. Why is not Jauncey interned? with his wife  Or why is he not handed over to the English or Canadian authorities to be dealt with as a traitor? At least, I suppose Canada could now conscript him as a British subject, and place him in the front trenches. Why is he at large, to continue to incite foolish and especially Socialist students in disloyalty, and to pose as a martyr and weaken the patriotism of his easy-going faculty friends? Patriotism here should be vigorous, rampant, fierce. That is the way Prof. W. H. Lawrence feels. He tells me he wont come around to the Faculty Union, because he is afraid of what he might say, and he might see Jauncey there. I ask the Department of Justice to help us in this great University community to be fiercely patriotic. We have seen many vigorous patriots in our faculty depart for the National Service. I have tried from April on to get in, but am 54 though in perfect health. Nearly all our professors are vigorously patriotic, but they hate to “create a scene” in the Jauncey matter. Cannot you eliminate him, with-out involving us? Even I would prefer that to being mixed up in a “rumpus” myself. I hope you can keep my name out of this. I think I have already weakened my influence in the Faculty Union for being rather “rabid”. I wish you would have a wise Agent call upon Prof. Lawrence and compel him and his wife to tell what is said by their next-door neighbor, Prof. Hermann Almstedt, Chairman of the Dept. of German. Mrs. Lawrence has hinted to my Wife what they have to endure in the way of pro-Germanism from Almstedt. This Jauncey affair in our own midst forces me to ask why your Department of Justice is so lenient in general with spies and traitors? Why do we not read of their execution? What does a German or pro-German care about the danger of internment? Make every such enemy realize that he continues to pursue his activities at the risk of his life. This is Our Country. My ancestors have been Americans for 283 years. We are AT WAR, or at least I thought we were: yet Jauncey and his thoughtless friends laugh in our faces. George Eric MacDonnell Jauncey, 1511 Windsor St.
C. J. Durand, 1413 Rosemary Lane. Socialist Club, meets in University Y. M. C. A. Building. C. A. Ellwood, 407 College Ave. F. H. Lawrence, 209 South Garth Ave.
H. Almstedt, 211 South Garth Ave.
Prof. H. Wade Hibbard, preferred address for mail, 1307 Keyser Avenue, Columbia, Boone County, Missouri. Since writing the above, I have been informed that a postman, opening Jauncey’s door this week to deliver mail, saw the house full of men. H.W. H.
I have to acknowledge with thanks receipt of your Letter of the 21st ultimo, in which you furnish information concerning Prof. Jauncey. The matter will be referred to the appropriate representative of this office for such action as may be necessary. This was not the case (note by SF). The reference to Jauncey’s wife is inserted in handwriting.